Adopting AI-powered intelligent tools can raise productivity, efficiency and even revenues at your organisation. By now, it is well established that artificial intelligence (AI) is not only changing the workplace but also revolutionizing it, doing everything from cultivating sales leads to automating pizza deliveries. But one of the most significant ways AI will soon redefine the workplace is with its ability to power the intelligence behind new intuitive digital assistants that promise to revolutionize business processes and empower employees to work more productively. Many organizations need these intelligent assistants now more than ever. A recent Gartner report found not only that 85 percent of company information is unstructured but also that the amount of such information is doubling every 18 months. In addition, nearly 50 percent of professionals said they have struggled with documents and content scattered in disparate locations across the organization, according to a study conducted by Dimensional Research in tandem with intelligent information management company M-Files. In addition, the Dimensional Research survey found that 40 percent of workers had to search three or more locations to find a file or document and that nearly half of workers were unsure if they had the most recent version. In short, the copious amount of data generated on a daily basis is disorganized and overwhelming at best and detrimental to business continuity and productivity at worst. Over time, this lack of organized content management and its negative impact on productivity have the very real potential to damage bottom-line profitability. That’s where AI comes in. New developments in AI make deploying an intelligent digital assistant designed to help people do data-oriented tasks – such as prioritizing emails based on urgency, balancing workflows and proactively attaching relevant content to emails – a very real possibility in the near-term future. Perhaps not surprisingly, the journey to breaking down data silos and creating organized data across a company begins with content. In addition to understanding where it resides, organizations need to understand what the information is and how it can be leveraged as an asset to the company. In short, for content to be effective, it also needs to incorporate context. AI holds the key to creating content in context. To gain a deeper contextual understanding of data and to contextualize content, organizations can employ an intelligent metadata layer fueled by AI. Here’s how it works: AI automatically generates metadata to intelligently tag, store and manage each piece of information, thus eliminating the need to manually categorize content. AI then analyzes the metadata tags and relationships to apply context to that information. Once the defining characteristics are identified, AI can then proactively determine appropriate tasks based on the role of the associated individual, the data or the document itself, or on the information’s relevance to the organization. For example, an intelligent information management system may be able to procure relevant related documents and business objects – such as a customer, an account, a contact, a project and/or a case – without an explicit search. Such a system could also determine the nature and function of a document, such as a contract or an invoice, and subsequently organize and categorize that information to align with the needs of various departments in the business. The next step in the development of an intelligent digital assistant is to incorporate logical helpers. You may recognize these as spellcheck or grammar check, or even as prompts reminding you to attach a file or enter a subject line. Intelligent logical helpers take those prompts to the next level by understanding and applying keen insight to the contextualized information and providing “logical” assistance. Outside of the workplace, AI-powered logical helpers are abundant in daily life, assisting individuals with everything from providing commuter routes that avoid traffic and finding places to park to locating the nearest grocery store or the best-reviewed pizza. It is only a matter of time before these prompts become more intuitive about – and more ubiquitous in – all aspects of the workplace, from understanding how workers enjoy their coffee, to sending out critical documents ahead of schedule, to reminding employees about an urgent or unexpected task. The third and final step in the road towards developing effective intelligent digital assistants is to implement document categorization with information extraction. This step equips AI not only with context and logic but also with proactive insight that enables it to anticipate challenges, avoid egregious errors and generally stay several steps ahead of the user. These capabilities allow AI to proactively assist with business-critical information, such as analyzing metadata tags to attach content to emails or prompt users to answer high-priority emails first. It is not too far a stretch to imagine that in the near future AI-based systems will be able to share intuitive relevant content via email, prompt users to review related content ahead of impending deadlines or uncover high-priority documents that need reviewing. These intelligent systems may even be able to prevent employees from sending confidential or classified documents outside the network or otherwise anticipate and thwart behaviors that would violate compliance regulations or company policy. What’s more, AI-powered tools may also be leveraged to augment and expedite workflows, automatically managing information on the back end to send users relevant content and to accompany it with intelligent suggestions at appropriate times. The explosive growth of data in the enterprise today has already given rise to a more intelligent and dynamic approach to managing information. And there are no signs of this trend slowing down any time soon. 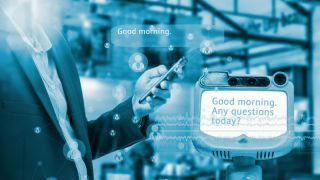 While enterprises are often at the cusp of understanding and managing their data, effectively deploying intelligent digital assistants represent the next step of that journey. AI is the force driving this critical tool, which is part of a greater overall digital transformation that is taking enterprises by storm. With the power to automate common tasks, simplify projects, streamline workflows and reduce the number of human mistakes, AI will be key in creating a new, revolutionized, intelligent workplace. Organizations that add AI-powered intelligent tools to their arsenal will be on a path to higher productivity, greater efficiency and increased revenues.